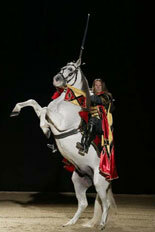 The most popular and longest-running dinner attraction in North America is Medieval Times Dinner & Tournament. Guests are invited to experience a delightful evening of family entertainment originally inspired by history of the 11th century. During your dinner experience, you will witness live swordplay, jousting, falconry, and horsemanship. You will be transported back in time and may even find yourself cheering for one of the Knights of the Realm as you feast on a decadent four-course banquet served in authentic medieval style. Your visitor experience will begin as you enter a complex designed to completely reflect a European castle from the 11th century. Walk past the Hall of Arms and admire the medieval artifacts on display, including coats of arms from prestigious families and an impressive collection of medieval weaponry. The Museum of Torture details the various forms of punishment used during the Middle Ages. Royal trumpeters herald the call to feast and summon guests to be seated in the arena. There, you will be greeted by none other than King Philippe and Princess Leonore, who will invite you to partake of a banquet truly fit for king while you cheer for your own designated Knight of the Realm representing Medieval Spain’s six authentic regions and six color zones for the arena’s seating. As your feast begins, you will be served by wenches and serfs who will attend to all of your needs during the four-course dinner. The Medieval Times Atlanta production will begin when the capture of a brave prince. As you watch, the arena will quickly fill with a stunning display of medieval pageantry and equestrian skills. There is never a dull moment as the Tournament of Games commences. Valiant knights will battle on horseback in fascinating games of skill, including the javelin throw, flag toss, and ring pierce. The heart-pounding exciting continues as the King finally receives word of the Prince’s capture. Dangerous sword fights and authentic jousting matches ensue as in a battle to maintain good over evil. As the tournament concludes, you will even have the opportunity to mingle with members of the cast and receive autographs from your favorite members of the Knight Club.